175,000 Gruffalos, in 5,833 boxes, on 130 pallets for 784 bookstores in the Netherlands and 32 in Belgium. A huge logistic task for the Dutch campaign Ik wil een prentenboek! (I want a picture book!). The campaign revolves around The Gruffalo by Julia Donaldson and Axel Scheffler (Lemniscaat). The book is on sale for just 2 euros from 7 April. Editor Jean Christophe Boele van Hensbroek from Lemniscaat is founder of Geef mij maar een boek! (Give me a book). About The Gruffalo, he says: "The focus is on donating. In bookshops, we put down money boxes where people donate two euros to give a book to a child whose parents can't afford it. We believe that a book is something you give to someone else. " 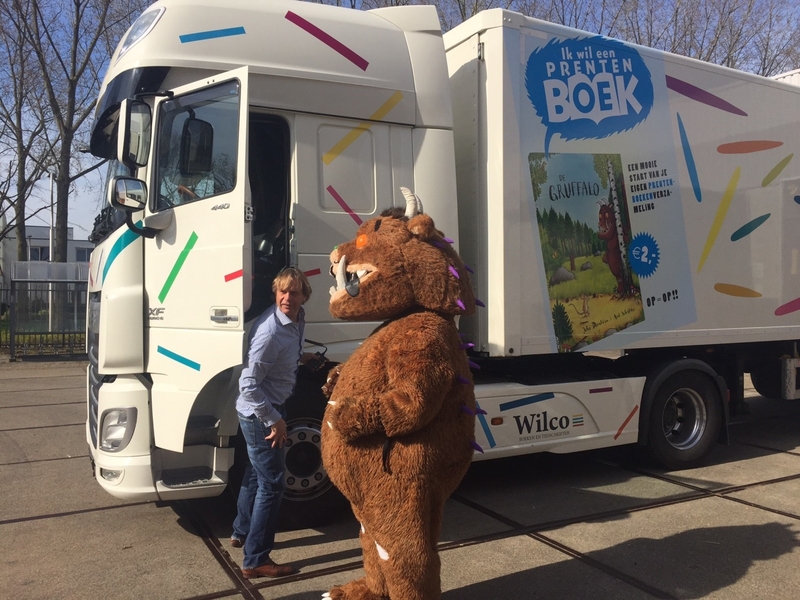 Photo: The Wilco Printing & Binding truck arrives with Director Robbert-Jan de Rooij behind the wheel. He is delivering the books together with the Gruffalo.